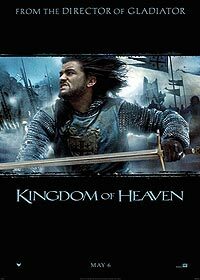 Ridley Scott's epic film on the Crusades of the 12th century. Balian of Ibelin travels to Jerusalem to atone for his sins, only to end up the defender of it's people against the Saracens. Guy de Lusignan: "Assemble the army!" Balian de Ibelin: "My lord, how will you ride if you have no stick to beat the horse?" Godfrey de Ibelin: "Whoever dies here today, you will certainly be among them." Balian de Ibelin: "What is Jerusalem worth?" Priest: "To kill an infidel, the Pope has said, is not murder. It is the path to heaven." Godfrey de Ibelin: "Jerusalem is easy to find. You come to where the men speak Italian and continue until they speak something else." Balian de Ibelin: "What man is a man who does not make the world better." Godfrey de Ibelin: "Be without fear in the face of your enemies. Be brave and upright that God may love thee. Speak the truth always, even if it leads to your death. Safeguard the helpless and do no wrong. That is your oath." Imad: "Your quality will be known among your enemies, before ever you meet them my friend." Templar Master: "There must be war! God wills it!" Guy de Lusignan: "My wife does not lament my absences. That is either the best of wives or the very, very worst."